I went through a period of taking pictures of ‘Big Pot Little Pot’ combinations, but today’s version is just pure and simple: BIG POT. 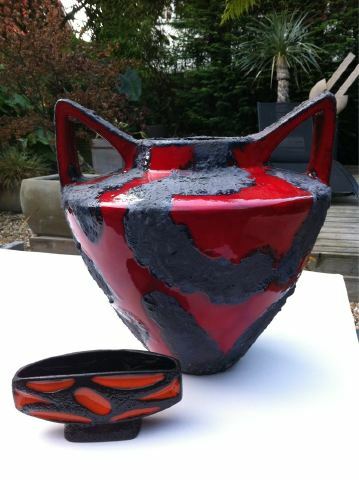 This amazing pot is appearing courtesy of Richard (@dipperdog), a collector of West German Pottery who really knows his stuff, seeking out the very best in in the WGP world. You can be assured that if Richard likes it, it’s something of good design, style and quality. This is made by the Roth factory, and I wouldn’t say they were normally known for their gigantic pottery. 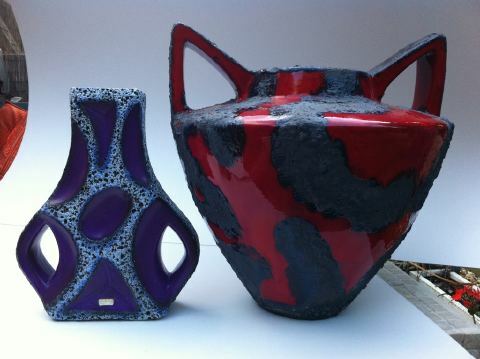 Skilful, unusual and detailed glazes, yes… but not size. They are usually a quality over quantity type of company. This one seems to combine both, however. Look at that design – those handles are like the loops of a bow, or a cat’s ears. In fact, that’s exactly what it is now I’m looking at it – a cat’s face! I’m sorry, I have this odd thing of constantly looking for faces in everything, along with comparing people to animals and trying to name everything. Anyway, that weird fact about me aside, this is a lovely pot and I’m so glad Richard let me post it up here. I’m off to a gig tonight, to see Beth Jeans Houghton at the Deaf Institute. I was there last night with friends for, what I thought was meant to be the Spotifriday night; presuming this to be indieriffic due to TDI’s usual music stylings… no, no it was not. Cheesy 80s and the Best of Jamaican Dancehall 2002 by the sound of it. And, as everyone’s talking about it, how glorious is this weather? Are we sure we’re in October, and we’ve not all experienced some mass ‘Flash Forward’ style event? It’s just glorious. Speaking of which, I’m off to do a bit more reading of ‘Fingersmith’ in the garden. Hope you’re having a lovely Saturday too.